Figure 2 15. Action of Catapult Lever-Type Accelerating Mechanism. locked together, the total weight of the recoiling parts should he kept to a minimum. practicable gun is limited because there are limitations on how light the recoiling parts can be. 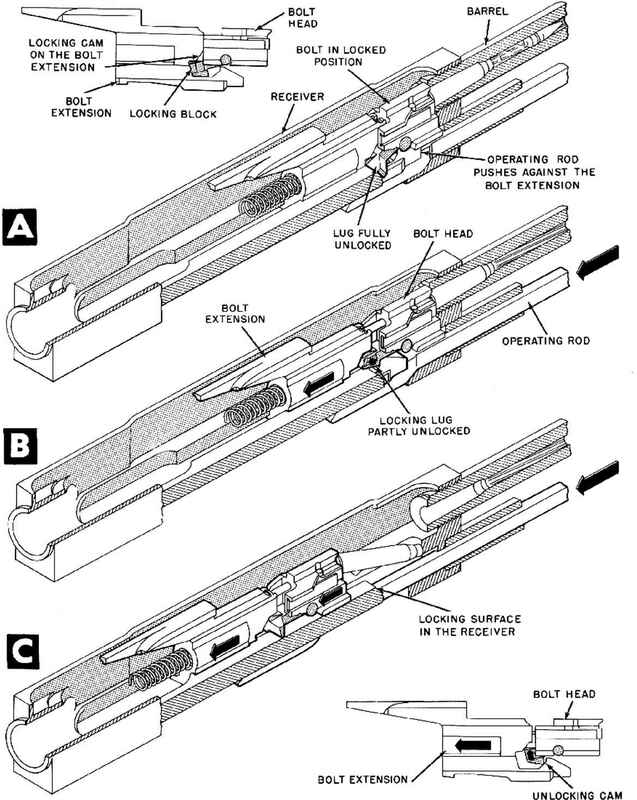 In order to perform their functions and to withstand the forccs to which they are subjected, the barrel, bolt, and other recoiling parts must be ruggedly constructed and will ncccssarily be fairly massive. This is particularly true of the barrel which must be de signed for sufficient strength to withstand the peak pressure of the propellant explosion and is also true of the barrel extension, bolt, and bolt locking device, all of which are subjected to the large forces produced by the powder gas pressure.